Want a Stand Up Paddleboard but don't have the space? The Pulse Inflatable is the perfect solution. The 11'3" inflatable board deflates to fit into a backpack style bag that easily fits into any car trunk or home closet. The Pulse Inflatable performs just as well as the traditional epoxy SUP thanks to it's 6" thick drop-stitch construction, 15psi inflation limit and stability enhancing shape. The Pulse Inflatable comes with a high-pressure pump and pressure gauge allowing you to quickly inflate your SUP anywhere. 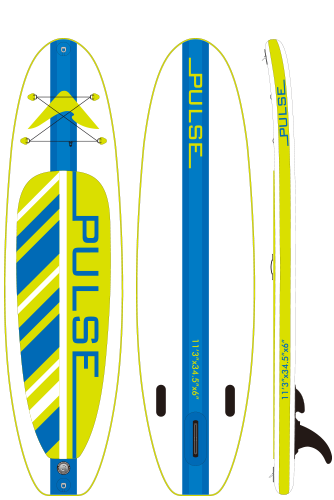 All Pulse Inflatable boards have nose, tail and centre carry handles, 3/4" length diamond groove pad, elastic deck-rigging, D-Ring for leash attachment, US Box compatible centre fin, side fins.